It may come as a bit of a surprise but these days burning wood or solid fuel is considered to be a very environmentally friendly way of supplementing the heating for a property. It wasn’t that long ago that this was frowned upon but now it is acceptable and even encouraged in some areas. In fact with recent amendments in the planning regulations you might not even have to seek planning permission to have these installed. So what’s the big deal? Well, multi-fuel burners are considered to be very energy efficient and very good for the environment, as well as giving out a substantial amount of heat energy. In many cases these stoves can not only supplement the main heating system in a property, but can also help to reduce the actual usage of the main heating system and therefore the amount of fuel that is used. This could help to save on the fuel bills. There are many different types of Solid Fuel Stoves or even open fires, so why go with a Multi Fuel Stove? Very simply the Multi-Fuel stove gives you the best of all worlds. With an open fire, although you can burn almost any material, you have to contend with the airflow down from the open chimney flue. This will not only leech the heat from the fire when it is going, but also causes a draught of cold external air which can reduce the ambient temperature in a home. Most fire places don’t come with a means of sealing the chimney over between uses so the draught might be a permanent feature in a home. There is also the fire risk from having an open fire in a grate, as well as the disposal of the ash in the grate afterwards. With a single fuel type Stove you have a situation where you can’t benefit from burning different types of solid fuel. With a Multi-Fuel stove you can not only take advantage of the different fuel types, but can also benefit from the different burning rates of the fuels as well as any market cost differences at the time. A Stove is basically a container made of metal holding a fire. They can be manufactured from many materials, including brick, but most often it is metal. There is an inlet for air to enter to create and maintain combustion, as well as to expel exhaust gases. These exhausts are normally flexible pipes that are attached to the chimney creating a secure seal which means that less of the heat is wasted and that there is no down draught down the chimney to disrupt the ambient temperature of the house. 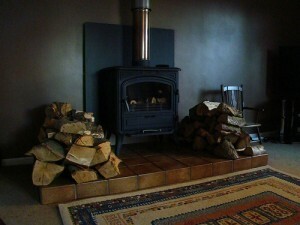 By use of these methods and the materials the stove can provide more effectively and efficiently than an open fire. In fact the modern standards of Multi-fuel Burners have efficiencies of around 75% – 90%, meaning that up to 90% of the fuel burned in the Stove should be used to create heat. The old concerns over particulate emissions which cause the previous restrictions in the uses of open fires have also been addressed. The old fashioned fires and wood stoves led to around 50 grams or more of particulate matter being ejected into the atmosphere. Modern designs of stoves and of the fuels burned have led to only around 5 grams of particulate matter per hour being ejected into the atmosphere. It is important to make sure that the system is installed correctly, but it is possible to do this on a DIY basis or by finding a professional installer. We would always recommend seeking professional advice as they can not only advise you as to the regulations and the remedial works that may be required to make the Multi-Fuel Stove operate most efficiently but also help you size the system so that it correctly provides the amount of heat that is required. We have focussed upon using a Multi-Fuel Stove as a form of secondary heating as a supplement to the main heating. However, it is possible to obtain Multi-Fuel Stoves that can provide the main heating for the property as well as to provide the hot water as well. If you are looking for an efficient and versatile heating system then you should consider a Multi-Fuel Stove.